Trends are born and then trends die a natural death until they surface again. But if you love fashion as much as we do, then it’s better to know your accessories in and out. Because you never know if you might become a trendsetter, making an accessory stylish again. Ear cuffs have been making the rounds from 2014 and 2015 and this accessory is all about attitude and now it has become a timeless accessory which you should know about! Like any other accessory, you are spoilt for choice as there are quite a few options to choose from. 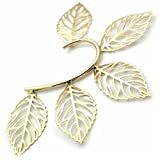 This post will take you through some of the most popular types of ear cuff earrings that are up for grabs and are available in the market. 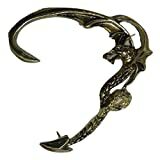 If you want to play it safe and not ruffle too many feathers with your ear cuffs, then select this type. It is simple and, at the same time, it is very elegant. 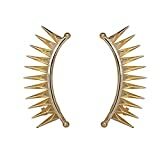 Try out the spike cuffs if you really want to show people that you are the boss. 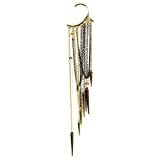 This edgy accessory can completely change your look and is a must try. This type of cuff is really pretty, to say the least. So, if you want to make a style statement, then this is your chance to do so. 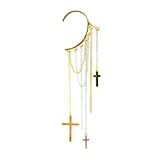 The long and multi-chain variety of this accessory is dramatic. Some of them have an attachment which will allow you to pin it to your hair. Well, if you want to be bold then this might do the trick for you. Have you been thinking about getting in touch with your wild side? Even if you are not but want to carry out a look just for its shock value, then this is the perfect option. Snakes, dragons, or even aliens gives a really wild look. If you are a big fan of rings but wouldn’t want to have ten piercings on each ear then this is just for you! This is easy to wear, minus the pain involved during piercing.